Today, we celebrate the 500th anniversary of John Calvin’s birth–a man who towers over church history like few others. Many of those I follow on Twitter are sharing their favorite quotes from Calvin’s writings, but as one rightly exhorted, get to know the man himself and not the caricature. 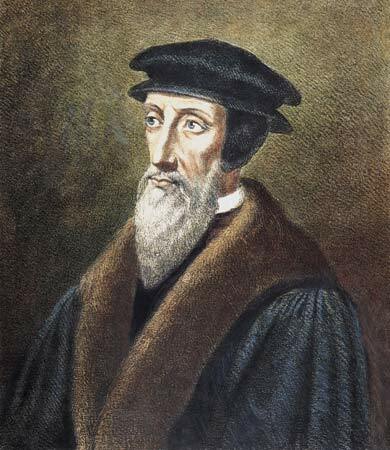 In the book, John Calvin: A Heart for Devotion, Doctrine, & Doxology you get just that–a great picture of Calvin as he was, not what some today are trying to make him out to be. Below is a review for that book published in the Founders Journal. Parsons, Burk, ed. John Calvin: A Heart for Devotion, Doctrine, & Doxology (Orlando: Reformation Trust, 2008), 257pp. $19.00. Whether Worthen’s assessment is a misperception or not can be argued as a litmus test for Calvinism according to John Calvin, for Calvin knew nothing of this kind of doctrine that resulted in pride rather not humility. The book, John Calvin: A Heart for Devotion, Doctrine, & Doxology is intended to peel back the layers of modern-day half-truths and caricatures to show the true nature of the man and his message. The editor, Burk Parsons, explains that “the purpose of this volume [is] that the people of God might more fully trust, invoke, praise, and love the Lord” (xix). More than a focus on Calvin, this book, as Calvin would so desire, transcends to a deeper and truer knowledge of Calvin’s God. If it is agreeable that “a true Calvinist is one who strives to think as Calvin thought and live as Calvin lived—insofar as Calvin thought and lived as our Lord Jesus Christ” (6), then it is incumbent upon all Calvinists, especially those brought up in this recent resurgence, to read this book. Divided into two sections, the excellent list of contributors provides both breadth and depth into both Calvin’s life and thought in way that both the layman and scholar can richly benefit. But more importantly, the tenor of the writings exhibit the humility of Calvin and cast his writings under the majesty of the God whose fear was always in his heart. Calvin’s life-long prayer was, “I offer my heart to you, Lord, promptly and sincerely” (32), and what this book does is provide a panoramic picture—whether as disciple of Christ, churchman, preacher, Reformer, theologian, or statesman—of how that prayer produced a man who was “mastered by God” (7). Of all the books that are available today in honor of Calvin, perhaps there is none other that can give you a glimpse into a man who gazed at God through the lens of His Word. Given the popular misperception that Calvinists are not committed to evangelism, missions, or church planting, however, it would have been more fitting to highlight Calvin’s impact in turning Geneva as the greatest missionary sending city during the Reformation. Should we glean from the teachings of Calvin, we would have as a tutor a man intimately acquainted with the greatest knowledge in the world—God Himself. Should we follow the example of Calvin, we would have as a friend a man whose devotion was a touchstone of humility. A closer look into the life of Calvin would garner a deeper love for God and His Word, which to no one’s surprise, reveals the enduring impact of the contribution he made, and continues to make, 500 years after his birth. “What Would Jesus Smack Down?” by Molly Worthen The New York Times (January 6, 2009). Available online at http://www.nytimes.com/2009/01/11/magazine/11punk-t.html?_r=5&partner=rssnyt&emc=rss&pagewanted=all (accessed January 23, 2009).